In a run that's seen Princes Diana separated and exiled from her homeland, at the tail end of an incarnation of the series that included Amazons on a rampage through the streets of Washington DC, Gail Simone starts Wonder Woman: Contagion with a Diana conflicted over her warring identities, and ends it with a peace long-time readers thought they might never see. Contagion is a fitting conclusion to Simone's Wonder Woman stint, with a strong and exciting final chapter. Gail Simone's Wonder Woman stories have very much been about war and peace. How can Diana be an ambassador of peace and still fight enemies willing to slaughter in their hate for her, Rise of the Olympian asked. What right does a warrior have to friends and loved ones (Olympian again). Can a warrior also be a lover, and have a family (this, from Warkiller)? Diana's enemies in these pages have reflected difficult parts of Diana herself, like Alkyone, whose crazed loyalty to Diana's mother rivaled her own; Achilles, blindly faithful to the god Zeus when Diana's own faith rightly wavered; and Genocide, the single-minded killer born of Diana's own flesh. Simone used all of these to remind Diana and the reader of the incongruity of Diana's dual missions, peacekeeper and warrior. At the beginning of Contagion, some of the wounds between Diana and the Amazons -- and between the Amazons and the rest of the world -- have healed, but the children of Ares still reveal some simmering resentments. It is only when Diana fights her own alien doppelganger for the fate of the world -- the entire world -- that she's able to combine her two sides. Not just Diana, but all of the Amazons join Diana in her mission of peace (even if at times through violence); when Diana sees the aliens' ultra-violent interpretation of the Amazon way, it gives her perspective on the blessings in her own life. Contagion marks the end of Wonder Woman's life as we know it, essentially, with J. Michael Straczynski's new origin to follow and then the DC Comics relaunch. Simone smartly recognizes in the finale of Contagion that what needs resolution here is not Diana's relationship with Nemesis or the final dispensation of Genocide, but rather the larger rift that's existed between Diana and her heritage since Greg Rucka's run, at least, well before Infinite Crisis. Contagion's final scene of Diana, her mother Hippolyta, ally Artemis, plus Achilles and Steve and Etta (Candy) Trevor celebrating in the middle of the street is -- let's say it -- a wonder, the very thing that would have been unheard of when this book began. I sense, still, that these stories were abbreviated by DC's new line-wide plans, but the final scenes are eminently satisfying, with clear, joyful art by Nicola Scott. The book does deal with a "contagion" of sorts, referring to the serpent plague through which the Citizenry aliens devour a planet's resources. "Contagion" is the title of the first part of the "Wrath of the Silver Serpent" story, which would have been a much better title in my opinion given "Silver Serpent"'s auditory similarity to long-time Wonder Woman villain Silver Swan. The actual silver serpent here is a lesser threat handled by Achilles and company, but I'd just as soon have seen the alien Theana join Diana's rogues gallery as the new Silver Serpent. Simone presents Theana's origins as a dark bastardization of Diana's own and it makes the character instantly compelling; that Simone parallels Theana's story with a retelling of the day young Diana left Themyscria (with great art, again, by Scott) only adds to the depth of it all. Mores the pity that Simone kills off Theana at the end of the book; I'd have liked to see Diana face the Silver Serpent again (DC Relaunch notwithstanding). Part of the seeming quick wrap-up in this book that I mentioned earlier is evinced by the two-part "A Murder of Crows" story that begins Contagion. A driving theme in Simone's run has been love and family and children; Alkyone resents Diana, for instance, for the way her birth changed the character of the Amazons; Diana began a tricky romance with Nemesis with the intention that her children might preserve the Amazon way; men live for the first time among the Amazons. None of these stories end quite the way they seemed they would, but ultimately five Amazons emerge pregnant of Themyscria, all through immaculate conception, and give birth to demon sons of Ares. Given all of this build-up, the "Murder of Crows" story that sees Diana fight Ares's demon children ought be fraught with meaning. Instead, the two issues balance the demons' horrific attacks with slapstick humor between Diana and guest-star Power Girl; Diana defeats the demons ultimately by spanking them. The tone is right for a Power Girl appearance, and indeed Diana's differing interactions with Justice League/Justice Society stalwarts Power Girl and Black Canary -- reflecting Diana's own aspects of brawn and brain -- is probably worth its own separate study. However, Power Girl's comedic presence entirely overshadows Diana's otherwise really very serious conflict with Ares -- and how these demons are part Amazon, how Ares can be gifted with children but Diana can't, and what children mean to Amazons and what they mean to Diana -- and there's significant material in the end that I think ultimately ends up not being addressed. This is even letting alone that Contagion ends with no additional mention of Nemesis, the Ichor, or Zeus, among others, but again, my sense is that the end of Gail Simone's run on Wonder Woman was somewhat unexpected. That does not by any means overshadow the fact that Simone has given us five sound Wonder Woman collections that were as compelling (especially The Circle) as they were startling (Rise of the Olympian remains my top favorite). This is a different Wonder Woman than Greg Rucka brought us (less political, more superheroic), a different take but still a great one. Let's hope, when we visit Diana again post-DC Relaunch with Brian Azzarello and Cliff Chiang, we might be able to say the same. But first -- for its ties to Justice League: Generation Lost and its lead-in to the new DC Universe, we'll follow Wonder Woman to its conclusion with J. Michael Straczynski's Odyssey. The Collected Editions review of volume one ... next! I wanted to like Simone's run on Wonder Woman more than I did. The whole run left me with entirely mixed feelings. I felt that she kept taking credibility away from the threats Wondy faced and I came out of the whole thing feeling that Wondy was just a dull character. There were some very nice twists and great moments and I enjoyed the greater emotional focus. Kind of found the run to be a mixed bag really. Going to give Azzarello a chance to show me that I'm wrong about Diana though. I thought the villains were one of the best parts -- Alkyone, Theana, Achilles, and especially Genocide. Appreciate the different opinion -- in what way did you feel Simone "took credibility away from the threats?" I think Simone has the best characterization of Diana that I've ever seen (slightly better than Rucka's, at least in that it's well-rounded) but I was ambivalent enough about the actual stories that I switched from buying the trades to checking them out at the library after Rise of the Olympian. I had my moment of ambivalence after Ends of the Earth, but Rise of the Olympian put Simone's Wonder Woman on my must-read list -- I found that one chilling on the second and third read, even. I think I'm still inclined to favor Rucka's Wonder Woman over Simone's if only because I loved the political bent of Rucka's run, but ultimately this caps a good long stretch of well-written Wonder Woman stories, marred only by the Amazons Attack days -- which, unfortunately, I think is more what people remember than either Rucka or Simone's stories. While Warkiller was clearly the payoff to Simone's initial 2-year plan for Wonder Woman, the two arcs collected in his TPB feel like a simple extension of her run instead of a big finale. I wonder if she had more WW stories she didn't get to tell. And for completists like myself, it would have been nice if DC were careful enough to include the short story Simone and George Perez did for Wonder Woman #600 in this volume. Great review! I think I prefer Simone's run over Rucka's (although admittedly I haven't read all of Rucka's WW), oddly because of the same reason - the political aspect in Rucka's. Just a personal thing, but generally I find too much politics a bit of a turn off... Gail Simone's Wonder Woman was one of those things where I just had to get all of the collections after reading the first one. For my money, the Simone/Lopresti combination produced the definitive Wonder Woman. It's even more of a wonder (sorry), considering the unenviable task Simone had after 'Amazons Attack'. I ought have mentioned that one disappointment in this book -- not Simone's fault, certainly -- is the absence of Simone and George Perez's Wonder Woman #600 story. I've only seen snippets, but I understand it had loads of guest stars, and it would have closed Contagion well. More's the pity. Agreed Lopresti really killed it on this series, and I'm eager for his work on Justice League International. 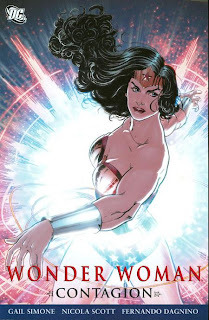 @MrImaginary, I don't know if I would characterize Rise of the Olympian as presenting Wonder Woman as "legend/hero" -- there are aspects of the story that (intentionally, I think) echo the superheroics of Death of Superman, but plenty of gods and monsters, too, if that's what you mean. I enjoyed Simone's run quite a bit. I have not read my trades in a while but first of all, I liked how the series had a nice consistency, which I think helps a series out a lot. I thought her villians were good and it's nice to see new ones rather than the same ones over and over. Two things I didn't like though; and they took place "behind the scenes." You could tell Simone was building a nice little WW run and she had more she wanted to tell. I was dissatified with the ending as an end to her run. It felt rushed -- most likely due to JMS being announced as the new writer -- and didn't give WW or Simone a true ending. If I remember correctly there were some plot points still in the air that I would have liked to see Simone finish. The other thing I didn't like was how all of Simone's previous trade collection were hardcover and then for this they switch to paperback only; what the hell? That's a big no-no in my book. Pick a format and stick with it. I think among those unfinished plot points was Diana's relationship with Nemesis. That Superman marries Lois Lane and Batman has a child with Talia al Ghul but Wonder Woman can't wake up in her boyfriend's apartment is one of comics' strangest double-standards, and if anyone could've made some headway in correcting this, it would have been Gail Simone. I don't know if that's what Simone intended or where the story was going, but I do think it's a shame Nemesis didn't appear in the conclusion, whether this was by design or extenuating circumstances. Agreed on the format issue, too, though better I think that a book drops from hardcover to paperback than goes up from paperback to hardcover as Green Lantern Corps did. If it weren't Wonder Woman, I wonder if DC would have started collecting the book in paper, or whether the drop from hardcover to paper would have been a drop to no collection instead.